Sir Philip was a sixteenth century Italian Catholic Priest who founded a society of clergy known as the Congregation of The Oratory. In 1847, John Henry Newman (Cardinal Newman) established an oratory in St Philips name in Birmingham. Cardinal Newman himself lived in the building. The Oratory still stands on Hagley Road. The religious community also set up a school, in 1887, on the Hagley Road (which became St Philip’s School and ran until 1995). It seems that an orphanage was also established in 1861 and given the name of Sir Philip Neri. Unfortunately, I have not yet been able to determine where the orphanage was and its precise relationship with the Oratory and St Philip’s School. I also cannot find evidence of it in the 1901 census suggesting either that it had closed by this time or had changed its name. 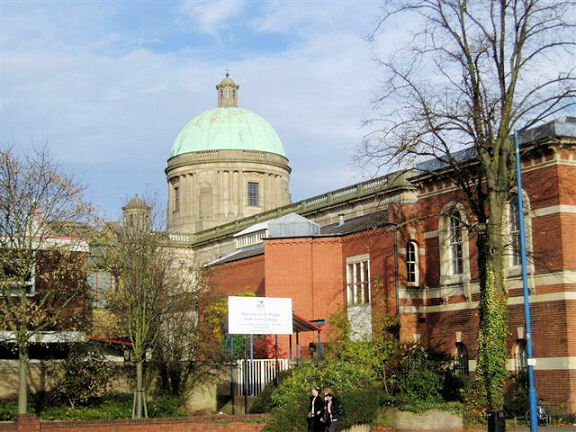 The Birmingham Oratory in 2012: it is possible that the orphanage was within the Oratory buildings.